Fascinating 16th century map depicting modern day Afghanistan, Iran, and Pakistan. 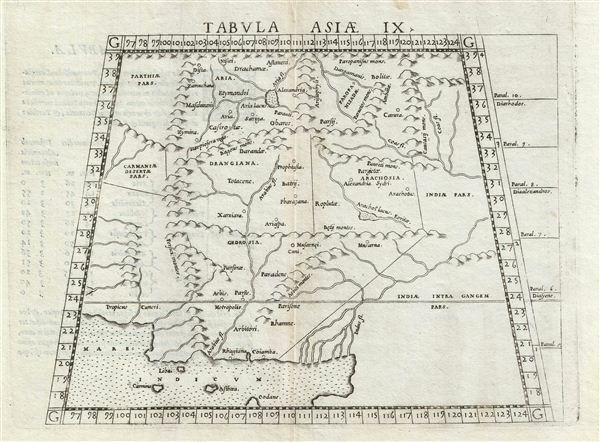 This is an uncommon 1588 Ptolemaic map of Persia, Afghanistan, and Pakistan issued for Girolamo Ruscelli's Italian edition of the Geografia di Tolomeo. Cartographically Ruscelli based this map on interpretations of Claudius Ptolemy's Geographica by Bernard Sylvanus and Sebastian Munster. The map covers the regions between the ancient Parthia and the Indus River valley and between Aria (Herat), and the Indian Ocean. Though somewhat difficult to understand at first glance, this map corresponds to many actual locations and is upon close examination yields is secrets easily. The Indus Valley is readily identifiable on the right separating India (Indiae Intra Gangem) from Arachosia and Parisene - modern day Pakistan. Further east west, across the mountains we enter Gedrosia - a Hellenized term corresponding to today Balochistan in southwest Pakistan and southern Afghanistan. Further north, in the valley of the Helmand River, Drangiana, the modern day border region of Iran, Pakistan, and Afghanistan, is noted. North of Drangiana are the mountainous foothills of the Hindu Kush. In the midst of these mountains is set the valley of Aria, an ancient Satrapy considered by Herotodus to be the breadbasket of the Persian empire, and corresponding to the modern city of Herat. The lake seen here and identified as Aria Lacus, is in fact Zarah - a wetland in western Afghanistan. A fine, collectable, and early piece essential for any serious collection focused on the cartographic emergence of Persia and Afghanistan in european maps. Published in Girolamo Ruscelli's Italian edition of the Geografia di Tolomeo. Very good. Text on verso. Original centerfold. Original platemark visible. Overall a very nice crisp example.